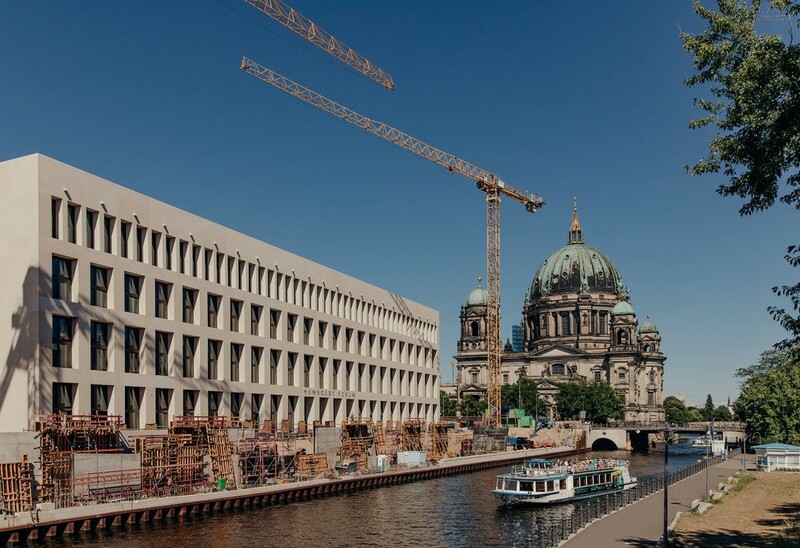 BERLIN — One Saturday morning in February, about 100 protesters marched loudly through Berlin’s streets to the Humboldt Forum, a new museum rising beside the River Spree. The Forum, which cost 595 million euros (almost $700 million), is being housed in a rebuilt palace, a fixture of the German and Prussian imperial past that was bombed during World War II. The prospect of objects gathered during the colonial era moving into Kaiser Wilhelm II’s domain has focused further attention on the period, which the nation has never properly processed. Many of the ethnological materials that will be in the museum’s impressive collection were amassed during that era, under circumstances that aren’t altogether clear. Maybe it was never going to be easy to build a major new museum in a country with such a freighted history as Germany. But the Humboldt Forum has upset a lot of people. When it opens, there will be huge wooden boats from the South Pacific, a Buddhist temple from 5th or 6th century China and a royal throne from Bamum in western Cameroon decorated with glass beads and shells. A new museum crammed with jewels of non-Western art and culture in the center of the reunified capital seemed a good idea: It would show Germany as confident and open to the world. It would also give the country another world-class institution it could be proud of, comparable to the British Museum or the Louvre. But as impressive as the museum itself is the vitriolic debate that has arisen. One of the Forum’s three founding directors, the art historian Horst Bredekamp, described the furor as a “psychogram of Germany” and said that the critical pushback is hijacking the original purpose of focusing on German scientific enlightenment and exploration. The disagreements also provoked the resignation of a well regarded advisory board member, Bénédicte Savoy. “The baby is dead on arrival,” she said in an interview, denouncing the museum as a conservative project that does not reflect a modern Germany changed by immigration and crying out for new thinking. In the era of a divided Germany, a Parliament building was erected on the same ground. It was torn down a decade ago to make way for the rebuilt palace. This irritated those Germans who thought that you couldn’t rewind history, and that the architecture of their capital should be more forward looking. It saddened Easterners who were aggrieved that their story was being literally erased from the landscape. Nearly 30 years after East and West Germany were reunited, there is a longing here for an identity that goes beyond the Holocaust and World War II, postwar division, reconstruction and reunification. As modern Germany seeks to define itself in a more complex way, the urge is surfacing to discuss past glories of scientific achievement, history, art and exploration as well as to confront an uncomfortable part of its past. At the center of these convulsions, the Forum has pitted those who want to move on and celebrate national accomplishments against those who caution that Germany risks forgetting what it was. Germany has addressed World War II and Nazi atrocities, although these achingly difficult parts of its history may be impossible to atone for fully, but it still has not even begun re-examining its colonial era properly, critics say. “For too long the colonial period was a blind spot in our culture of remembrance,” Monika Grütters, Germany’s federal culture minister, said in a statement. The centuries-old Schloss, the original building at the heart of the debate, is seen as a link to an era of philosophers by its supporters; to its critics it symbolizes a seat of imperial power from a time of militarism and national expansionism — traits that ultimately brought down the Allied bombs on the castle in 1945. Then there was a worry, made more sensitive by the far-right’s recent inroads into German politics, that recreating the Schloss signaled a concerning nostalgia for an age when Germany was great, a view of the past that skimmed over the horrors of the 20th century. In another sense, the project, which will be completed soon, will make the center of Berlin aesthetically whole again, Wilhelm von Boddien, who helped raise the money to rebuild it, said. As he spoke, standing beside the Forum, he gazed out at the Greek colonnades of the nearby Altes Museum and the giant cathedral where the emperors lay in their crypt. At the other end of Berlin’s central boulevard, Unter den Linden, stood the Brandenburg Gate. The Forum’s central place in the historic cityscape was clear. The East German Communist authorities gleefully demolished the war-damaged Schloss in 1950. In its place, they constructed a stark, smoked-glass-and-steel Parliament building, the Palast der Republik, which opened in 1976. It was a Parliament for a regime without true debate, but it also housed concert halls, theaters, an ice-cream parlor and a bowling alley. Many East Germans had fond memories of a visit there. At a recent exhibition at the site, Iris Weissflog, 58, a bookkeeper from near Dresden, was studying an old photograph of the Palast der Republik with her 8-year-old granddaughter. Ms. Weissflog, who grew up in the former East Germany, began to weep as she recalled how she sang onstage at the Palast when she was 14 years old. “I know it’s good to move on, but it means leaving the past behind,” Ms. Weissflog said. The idea to use the Schloss as a modern museum and a home for the non-Western art collections in Berlin finally gave the project the political momentum it needed to get built. The collection from Berlin’s Asian Art Museum and the non-European collection from the city’s Ethnological Museum form one of the world’s richest holdings of non-European art and artifacts. Displaced by war and the division of the city, the two museums had homes for decades in the suburb of Dahlem. But over the past few months, these collections have begun to return to the center of the city in preparation for the forum’s opening in 2019. The idea is that they are getting a prominent showcase in a beautifully redone historic building and will become accessible to many more visitors. The Forum will bring the Asian Art and Ethnological Museums together under one roof, along with exhibitions by the Berlin City Museum and Humboldt University. With so many players, the struggle to create a single new institution out of multiple power centers has led to countless headlines about dysfunction. (The Süddeutsche Zeitung reported that the project was in a state of “permanent crisis.”) In a city where the failure to complete a new airport has become a kind of national trauma, the Forum seemed to pose another test of the new Germany’s ability to get things done. It was one of the reasons Ms. Grütters, the culture minister, wooed Neil MacGregor, a former director of the British Museum and one of the world’s most respected arts administrators, to Berlin to be one of the Forum’s three founding directors. One of his tasks was getting the parts of the museum to coordinate and present a coherent offering. The power politics were blamed for the delay in attracting a new general director to replace the founding directors, as planned. Arguably, the biggest player is the Prussian Cultural Heritage Foundation, a powerful official body established after the war to preserve the cultural legacy of the former Prussian state. It runs many Berlin museums, and will continue to control the extensive collections in the Forum, raising questions about what influence any director can exert. It is called a “forum” because its organizers want it to be more than a museum — a place for meeting, discussion and investigation of big global issues like immigration, he said. The three founding directors stepped down earlier this year, including Mr. MacGregor, who continues as chairman of a panel of outside advisers. Their successor, Hartmut Dorgerloh, was most recently manager of an organization that preserves Berlin’s palaces and gardens. Some have wondered how his experience equips him to cope with the big debates unleashed in part by the Forum, but others regard him as a capable and connected administrator, an insider who will make sure it opens on time. He faces lingering questions — about why, for example, an ethnological collection should be shoved together with Asian art, other than to provide a purpose for an expensive building. But the biggest outcry continues to be about Germany’s colonial past. Historically, Germany came to empire building later than other European countries like France or Britain. But its colonial activities involved atrocities such as the genocide of Herero and Nama ethnic groups in what was then German South West Africa, and is now part of Namibia, and hundreds of thousands of deaths in the Maji Maji revolt in German East Africa, in what is now Tanzania. Germany’s colonialism was linked to what came next, according to Professor Zimmerer: Colonial officers developed ideas on racial purity, and the colonial expansion foreshadowed the Nazi push for land in Eastern Europe, for example. Germany lost its overseas territories in the Treaty of Versailles at the end of World War I, and so it was not swept up in the great postcolonial self reckonings of other European nations after World War II. By then, it was confronting the aftermath of its more recent history. Many of the objects in the Prussian heritage foundation’s massive collection were gathered in a spirit of scientific inquiry as explorers brought objects back from around the globe to preserve them and learn from them, Professor Bredekamp said. But countless others, according to the critics, were seized by force, or given by people who had no choice. Human remains and sacred religious objects, which collections in Berlin contain, would hardly have been surrendered willingly, the critics point out. “It is undisputed that the objects reached Berlin under unequal power relations and sometimes by force,” Viola König, a former director of the Ethnological Museum, wrote in the weekly newspaper Die Zeit. Among the most prominent objects in the Prussian Foundation’s ethnological collection are several hundred sculptures, Benin bronzes (actually made of brass), created in an ancient kingdom that is now part of Nigeria and borders on the modern nation of Benin. They were purchased on the open market but only after they had been looted by British troops. Mnyaka Sururu Mboro, a civil engineer, teacher and anticolonial activist in Berlin, wants the skulls of ancestors he says were executed by Germans in Tanzania returned to Africa. Amid the backlash against the Forum, the biggest blow came last summer when Professor Savoy, an art historian, resigned from its advisory panel, announcing that she wanted to know “how much blood is dripping from a work of art” and comparing the museum to Chernobyl for the tendency of its leadership to erect a roof over its problems. Professor Savoy has since become an adviser to President Emmanuel Macron of France, whose own steps at addressing his country’s colonial period have put Germany’s in the shade, according to many experts, and inflamed the European debate. The colonial debate that has at times seemed to overwhelm the Forum has prompted some action. There are plans to introduce new expert curatorial voices from countries where the objects originated, to get away from the idea that it presents a purely German take on the world. A specialist from Tanzania, for example, will be co-curator of an exhibition about that country. There are plans for other joint ventures with Namibia, though critics wonder what influence outside experts will really have. Where there has been a claim for restitution, this will be noted on an object being displayed, Mr. Dorgerloh said. Since the debate intensified, Ms. Grütters has encouraged a greater focus on colonialism. The German Lost Art Foundation, which traditionally investigates Nazi-looted art, announced it would widen its remit and give grants to museums for colonial provenance research. The heritage foundation and its president, Hermann Parzinger, agree that the provenance of objects in the forum’s collections needs to be more fully researched, and some things should eventually be returned. The heritage foundation returned nine artifacts it said had been taken from graves of indigenous communities in Alaska in the 1890s, and in August, several skulls and other human remains were given back to representatives from Namibia. Professor Savoy said in August that the new willingness to admit even just the need for provenance research and consider restitution is important progress. Germany may now be starting to catch up with other countries, experts say. The gradual approach, however, does not satisfy those who demand a greater admission of culpability in colonial crimes, a fuller inventory of colonial era artifacts and a more rapid return of objects. The right-wing party Alternative for Germany has also finally entered the debate, asking questions in the German Parliament about the cost of provenance research, raising fears among the Forum’s critics that the party could hinder the return of objects. Those on the anticolonial side continue to regard the forum as reflecting an affliction of Germany’s history. In February, the angry protesters marched from what they consider one historical sore to another — from the site of the 1880s conference convened by Otto von Bismarck to coordinate claims on central Africa to the grassy space in front of the forum. Their anger was palpable, but nevertheless many here welcome the debate that encompasses the Forum. “Without the Humboldt Forum” said Friedrich von Bose, a curator in the new museum beside the Spree, “the debate would not be” where it is today.